What is a nose jewelry backing? Nose jewelry backings are specially designed specifically to fit the gauges of nose jewelry. They are small, rubber transparent o-rings that fit on the back of your nose jewelry. They are used to keep your jewelry securely in place as well as can be used a size adjuster. You will receive one free with your purchase of nose jewelry from DiamondNoseRings.com. We also sell them in singles or value packs. We recommend always purchasing additional backings in case of loss. Throughout the day nose jewelry settings can begin to lift out of the piercing due to regular wear, or by touching your face, blowing your nose or catching on your clothing when getting dressed. Nose jewelry backings are used to help your jewelry stay secure. Once the backing is placed on the end of your jewelry, push it snug against the inside of the nostril. This adds extra protection against it falling out, but also ensures the stone will lay flat on the outside of your nose. Nose jewelry backings work with all styles of nose rings, bones, L bends and screws. They are also great to use with nose rings (hoops) to keep them from spinning through the piercing. Nose jewelry backings can be used when the post of your nose jewelry feels a little to long, or when you are trying to adapt to a different gauge or style. They are great for initial piercings where you may be experiencing swelling and want to adjust the post size and keep movement to a minimum. When using a nose jewelry backing for size adjusting you simply place the backing on the back of nose jewelry and push the backing to the desired fit. Backings are also great for septum piercing sizing and security. If using for the septum piercing, you will want to keep your septum jewelry centered in the septum. For this you will need two nose ring backings. Place the first one on and push it to the end of the post before you put in your septum ring. Place your septum ring in your piercing and then place the additional backing on. Then adjust to your desired fit. You can apply a backing to any style of nose jewelry. Applying the backing, can sometimes be difficult depending on the style! Make sure you are in an area where you can easily find it if it falls. They are transparent so are easily lost if they fall. Once you have the nose stud or other nose jewelry inserted, turn your nose stud so the post is pointed towards the opening of your nostril. 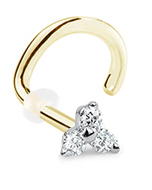 Use the opposite hand to hold the nose stud in place with your index finger by placing it over your nose jewel. With the same hand, use your thumb to lift the edge of your nostril up which will reveal your nose stud post. Once your finger is in place, hold your index finger with the backing up to the post of your nose stud. Aim the post right in the middle of the backing, and push on. Once your backing is on your post, go ahead and twist the nose stud back into place so the post is no longer showing. Once you have the nose stud or other nose jewelry inserted, turn your nose stud so the post is pointed towards the opening of your nostril. If you continue to have difficulties, try getting a friend to help. ABOUT – Why Choose DNR? We designed DiamondNoseRings.com with you in mind. Your nose is unique. We believe you should be able to choose your specifics for the most comfortable wear. Choose your metal, style, gauge, length and diamond. Not sure on how to do so? Check out our how to create the perfect nose ring page. If you receive your jewelry and it doesn't fit perfectly, we offer one free alteration and will ship your item back to you free of additional charge.